Since starting The "Q" Review in June 2010, I've reviewed seventy two BBQ sauces. Most of the sauces that I've featured have been very good. Some have been exceptional. With so many great sauces in the world of BBQ, it's almost impossible to choose a single favorite. However, that wasn't always the case. Before I started blogging, my exposure to great BBQ sauce was pretty limited. I primarily used the national brand sauces found in every neighborhood supermarket. The lone exception was Bone Suckin' Sauce. It's safe to say that Bone Suckin' Sauce was my clear favorite at the time. While The "Q" Review has expanded my knowledge of BBQ sauce a great deal, I've never had the opportunity to review the original Bone Suckin' Sauce. Fortunately, the good people at Snazzy Gourmet offered me the chance to do just that. Bone Suckin' Sauce is just one of many gourmet products offered by the online retailer. Bone Suckin' Sauce (Raleigh, NC) is one of the most award winning sauces on the market. 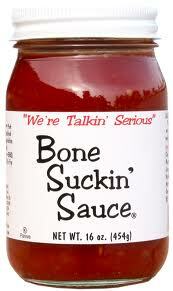 Publications like Newsweek and Food & Wine have even declared Bone Suckin' Sauce the best in the United States. Those kinds of accolades have helped Bone Suckin' Sauce grow from a small, regional product into a national brand. While many small batch sauces are now packaged in mason jars, Bone Suckin' Sauce was one of the first to use this trendy method of bottling. The bright red sauce is contrasted by a their recognizable white label. The look is simple, but very appealing. The sauce is on the thin side and pours very quickly from the wide mouthed jar. Bone Suckin' Sauce uses all natural sweeteners like honey and molasses for a rich initial sweetness. True to it's Carolina roots, the sauce also features a hefty amount of tangy apple cider vinegar. To create a truly unique flavor profile, the sauce adds a dash mustard and horse radish. Garlic, peppers, earthy spices and natural hickory smoke round out the ingredients. The sweet and tangy sauce begged to paired with pork so I cracked the seal on the 16 oz. mason jar for baby back ribs this weekend. Though the sauce is thin, it's just thick enough to brush on the meat. It takes a few coats, but leaves a beautiful glossy shine. The sweet sauce only gets sweeter after it hits the heat of an open flame. The tang mellows and the spices accent an exceptional flavor. The sauce was perfect on the ribs and paired very nicely with the salty rub that I used. Being relatively thin, it would also be fantastic poured over pulled pork, chicken or beef. It's easy to see why Bone Suckin Sauce is so well thought of. The company has managed to bring Carolina BBQ to the masses with their sweet, tangy concoction. After spending the last seven years in North Carolina, it's exactly the type of sauce that I've grown to love. Be sure to check our "Product Reviews" page to see Bone Suckin' Sauce's star rating. Note: Samples of this product were provided by Snazzy Gourmet. Check out www.snazzygourmet.com to purchase Bone Suckin Sauce or any of their other fantastic gourmet sauces, marinades, rubs and snacks. 1 Response to "Bone Suckin Sauce"
My go to sauce when out of Curt's! By far the best national brand.